5,000km on One Wheel for Climate Action! That's the journey Joseph Boutilier will be making across Canada during the Unity for the Climate campaign. Please view the full website or update your web browser for a better experience. Click here to do so. Including coverage from Yahoo News, The Toronto Star, The Ottawa Citizen, The Hill Times, Global, CTV, ABC and the CBC. Including elementary, middle, secondary and post-secondary school presentations, community groups and panels. Including Green Party Leader Elizabeth May, NDP Deputy Leader Megan Leslie and Liberal Environment Critic John McKay. It’s been more than two months since I successfully wrapped up my journey. After cycling 5,000km on one wheel, I was privileged to join hundreds of thousands of protestors at the historic People’s Climate March in New York, to meet MPs on the forefront of the political struggle for climate action, and to participate in three other rallies in Ottawa, including a 5-day fast and vigil with the great folks of ClimateFast. I have to apologize for the lack of reports since then. The truth is, I hate to admit that ‘Unity for the Climate’ is over. It was an amazing half year, bringing me in contact with dozens of inspiring organizations, environmentalists, travellers, athletes, teachers, politicians and journalists, and hundreds of other incredibly kind and thoughtful strangers. It was an exhilarating and intense experience, with the kind of focused goals and objectives one can only make for themselves. When not riding, I spent my time keeping tabs on global and national news that hinted at the looming deadline for real action, and at encouraging solutions emerging from the pinnacle of modern science and grassroots movements around the world. Now that I’m back in Victoria, preoccupied with a ‘real’ job (albeit thankfully one that allows me to continue to focus on political and environmental advocacy), I find myself swept back up in the frenzy of everyday life, where cycling - much less unicycling - needs be justified for the extra time it takes. I’m reminded how little of our daily lives we reserve for contemplating our most important collective decisions and actions, and how so many of those decisions are made passively – if uncomfortably – through thousands of small acts of convenience and a quiet acceptance of the status quo. The climate crisis calls for all of us to reconcile with the wider implications of our daily actions and personal priorities. I’m especially grateful that the memories of my trip continue to remind me of my personal commitments. Part of the reason I’ve delayed so long in providing a final update is because I wanted to hint at some new life for the Unity for the Climate campaign and site. The project gained some momentum on social media among Canadians coast to coast who support greater climate action. And despite many great journalists and publications I’ve encountered, I still feel there’s room for new blogs and content that breaks down the overwhelming science and politics of the climate crisis and the related, systemic problems with Canadian democracy. We need media that shines a light on the common roots of these issues and empower us all to take action. Unfortunately I don’t have the time or energy to make such a project happen at the moment, but I hope you’ll keep the Facebook page ‘Liked’ and email subscriptions valid. This way, we may one day reconnect in our common vision for an informed and empowered public, an accountable government, and a sustainable future. I owe thanks to hundreds – if not thousands – of people, without whom this journey wouldn’t have been possible. I owe an apology to all those I’ve surely missed in this list of people who kept me pedaling when the wheel deflated, the snow fell, the motels closed and the bears and beasts emerged. And let me thank all of you, especially, for your patience and enthusiasm as you followed along online, despite my sporadic and most always-belated updates. My mum and dad, Susan and Stewart for their incredible help • my girlfriend Silvey for still being my girlfriend • My uncle Patrick Wade for building out the uni • My uncle Andrew Wade for tons of gear and advice • My grandma Enid Wade for supporting me in everything I do • Uncle Victor Van Buskirk for helping with my launch • My sisters Hannah and Kate for believing in me • The rest of my incredible extended family • Cathy Orlando of the Citizens’ Climate Lobby • Rita Bijon, Frances Deverell, Lyn Adamson, Margaret Rao, and everyone else at ClimateFast • Que Bahn for all her help organizing in Victoria • Keith Chan of Island Trails Photography and Garth Racicot for official photography • Kristina at Sierra Club Ontario and Mikaela at Sierra Club of Canada •Andrea at Council of Canadians • MP Alex Atamanenko and staff Lilly Zekanovic • MPs Matthew Kellway, Ted Hsu and Megan Leslie • MP John McKay and staff for organizing a parliamentary press conference • MP Elizabeth May and staff • BC MLA Gary Holman and staff Ryan Painter • BC MLA Andrew Weaver and his staff • MLA Carole James • Councillor Alicia Cormier and the rest of Central Saanich council • All the incredible small businesses that have supported me through in-kind donations and private sponsorship including… • Eric and Johanne and everyone at Hartley Insurance in Victoria • Vancity for financial support • municicyle.ca for a great discount on the uni • Bob and Lucinda of Wild Ways in Christina Lake BC • North Park Bike Shop in Victoria BC • Denman Print Works in Victoria BC • Metropol in Victoria BC • Bikes and Beyond in Winnipeg MB • Tom and RJ of Bored Room Bistro in Midway BC • Imperial Motel Grand Forks BC • Darcy of Darcy’s By the Bay in Waubashene ON • Beth and all the friendly folks at River Haven Resort in Britt ON • The Downtowner in Creston BC • Kootenay River RV and Kampground BC • Daisy May Campground in Fort Macleod AB • Fieldstone Campground Moosomin SK • KOA Winnipeg MB • Helliars Resort in Nestor Falls On • Hay-U-Ranch Resort in Yahk BC • The Inn at Redmond House in beautiful Maple Creek SK • Anicinabe Campground Kenora ON • Bry-Mar RV Park Brandon MB • Willow Tree Spa Hope BC • Beverly Hills Resort in Christina Lake BC • Crawford Bay Inn BC • Pinewood Motor Inn Espanola ON • Serpent River Campground Sprague ON • Elizabeth and Camp Barcovan in Carrying Place ON • Wakamow Valley in Moose Jaw SK • Moose Lake Cottage Resort ON • Mohawk Motel in Massey ON • The Fenix in Picton ON • Puddingstone Harbour Resort ON • Sand Lake Campground and Cottages ON • Yazel, Jack, Denis, Brian, Liz, Steve, Rajiv, Jason, Heather and Diana for your donations which made the campaign possible • Plus…• Andrew Tuovinen • Paul Gatien • Andrew Dodd of Dodd’s Eye Media • All the performers at the Sidney BC Launch Event including Nostic, Inglewood, Audrey Lane Cockett, Morgan Purvis, Caleb Kennedy _ Family and Hayden _ Meagan • Greg Holloway, Doreen Webb and the whole ‘Aery Faery Tangent’ • Former Victoria Mayor Dean Fortin and current Mayor Lisa Helps • Oliver Giving • Judy Fraser • Andrew Tuovinen • Neil Smith • Andrew Slade • Glen and Sherry in Mission BC • Professor Steve Lapp, Gillian and family in Kingston ON • Vic, Nat, Riley and Gary in Hope BC • Councillor Kim Maynard and Dierra of Princeton BC • Emmy of Crowsnest Bakery, pastor Jason Weibe and family and mayor Manfred Bauer in Keremeos BC • Alex Smith of Radio Ecoshock • Ulli Diemer • David and Helen of Wolseley SK • Doug and Shirley in Ottawa ON • Mayor Brian Taylor of Grand Forks • Brenda Tyson and the children of Pinewood Elementary in Cranbrook • Eleanor and Dan, Paul Pichurski and the children of Isabelle Sellon and everyone else in Blairmore AB • Kelly Babcock in Ottawa • Marvin and Darlene in Portage la Prairie • Heather and Richard in Winnipeg MB • Max and Joe in Duluth MN • Shawn in Biwabik MN • The Orton family in Blind River SK •Liz Couture and everyone in the Richmond Hill ON NGO and business community at the Performing Arts Centre • Svend in Oshawa ON • Bart and Judy in Port Hope ON • Anita and everyone of the Northumberland Cycling Club, ON • Librarian Christine in Picton ON • Cal and Patty in Regina SK • Megan and Andrew in Medicine Hat AB • Sandy and Wendy-Anne in Manotick ON • Doug and Shirley in Ottawa ON • Sue and Charles in Ottawa ON • Everyone who showed up for my arrival on Parliament Hill and everyone who followed my progress online! 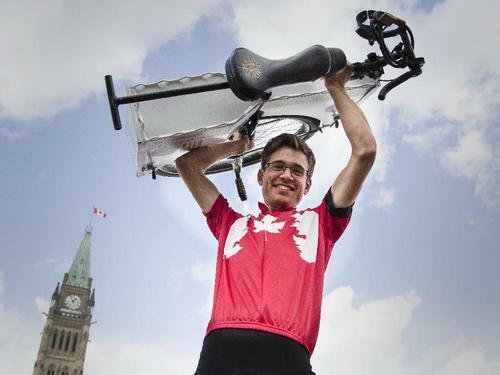 09/15/2014 - Ottawa Citizen - Joseph Boutilier took a 5,000-kilometre, five-month tour of five provinces and three U.S. states — all on his unicycle. The 24-year-old’s tour was dubbed Unity for the Climate. 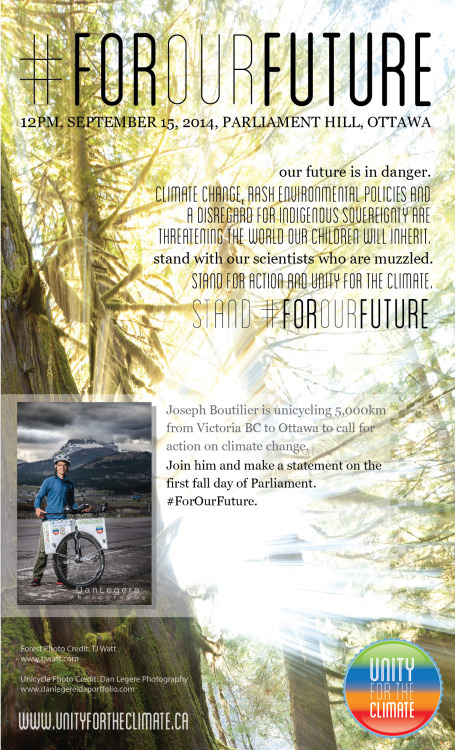 Rabble.ca - 08/27/2014 - Joseph Boutilier continues his journey across Canada to raise awareness about the climate crisis and to make climate change an issue in the 2015 federal election. Video Credit to: Sustainable Productions. 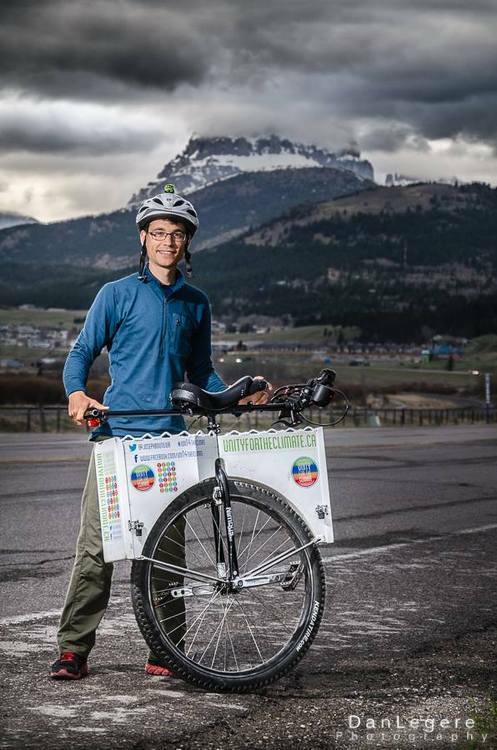 Victoria’s Joseph Boutilier is pedaling through northern Ontario on his way to Ottawa to try and stir up the conversation on climate change. 08/06/2014 - Sault Star - Possibilities are endless for one man on a bike with one wheel.